Old Spanish Days Fiesta 2018 is in the bag. Wow! What a fun-filled and crazy week it was. Baile de California shared the Fiesta spirit throughout the city. We danced at nursing and senior facilities- The Californian, Vista del Monte and Garden Court Apartments. In addition to performing for the residents, those who were able to, danced with us at the event’s end. Residents who were less mobile were encouraged to sway in their wheel chair or shimmy their shoulders. Some of the residents even sang the songs as we performed. As in previous years, one of our favorite events is Flor y Canto at the Courthouse Sunken Gardens. 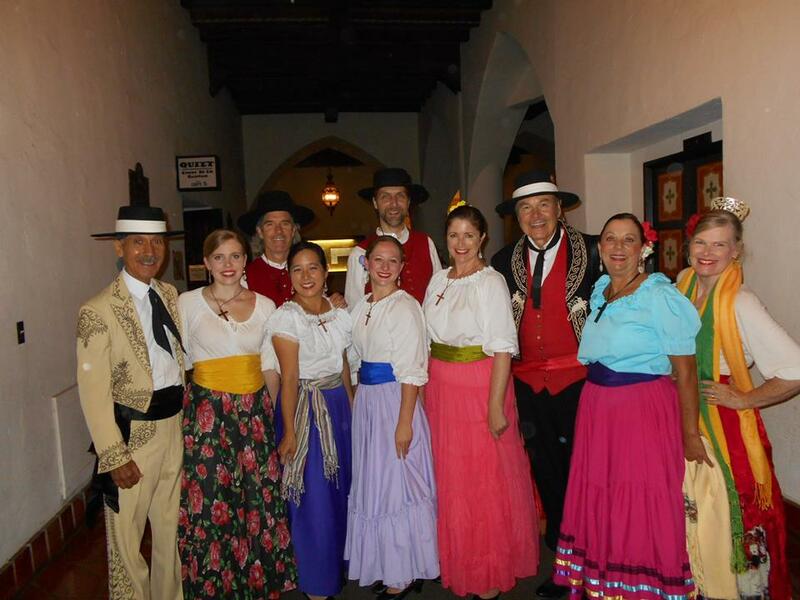 Flor y Canto “… is a rare opportunity to see the original Spanish California dances & songs of the 19th century. 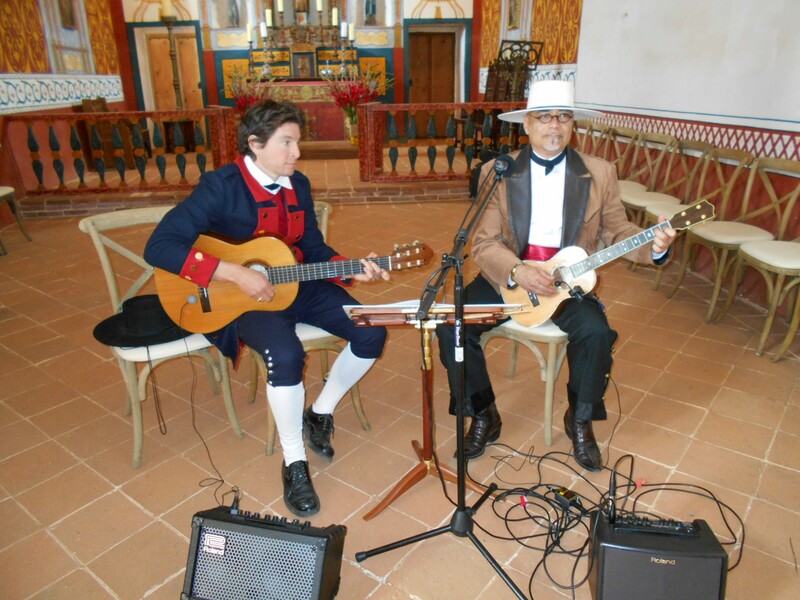 Interwoven with historic narration, the musical numbers are accompanied on replica acoustic instruments. 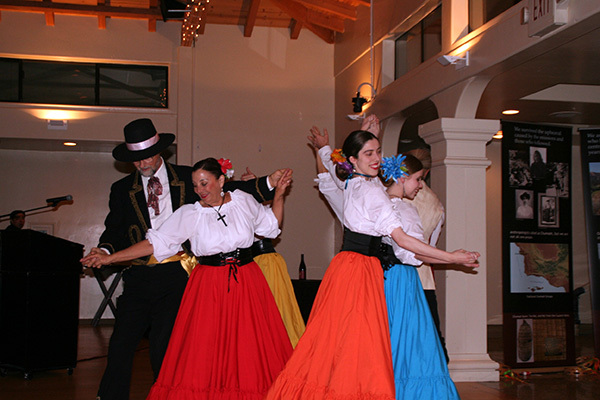 These unique songs & dances are performed by local residents [Baile de California] in authentic costumes much as they would have been 150 years ago.” Old Spanish Days website, https://oldspanishdays-fiesta.org/events/events-calendar 2018. Couples dancing La Contradanza. This dance was known to have up to eighteen figures. The early Barbareños loved dancing and learning new dance steps. Remember, there was no radio, TV, computers or internet to occupy time in 1840! Dancers left to right- Matt K.& Lisa F., Debbie F. & Rich S., Cheryl Long & Jeff Long, Melissa Chatfield & Jim Young. A new opportunity for BdC this year was to dance on not one but TWO floats in the Historic Parade on Friday. Five dancers were on the Santa Barbara Trust for Historic Preservation’s float, sponsored by the California Missions Foundation and four more dancers were on the Santa Barbara Mission’s float with three of the Fathers. Although is was hot dancing in the sun for an hour plus, we would do it all again! Dancing La Varsouviana. From left- Soldado David Martinez, watching the dance, Kira Purinton & Abril R., dancing Caroline Wedderburn & Diana Replogle-Purinton, guitarist- Luis Moreno. Rounding out the Fiesta season were appearances at the Santa Barbara Woman’s Club, La Merienda luncheon, a Fiesta tradition since 1926, Las Noches de Ronda and El Mercado del Norte. September 22nd, four BdC dancers- Cheryl Long, Jeff Long, Caroline Wedderburn & Roger Knox, plus the Flor y Canto duo, musicians Jim Garcia & Clare Barrios-Knox, made the annual trek to the Petaluma Adobe State Historic Park for their ¡Fandango! Also performing were the Anza Colonial Dancers (yesteryearsdancers.org) from Los Angeles, under the direction of Mlle. Irene Ujda and Los Californios®. We have had the pleasure of working with both groups at previous ¡Fandangos! Also attending were past Baile de California dancers, David Martinez and Martha McGettigan. Learning to dance “El Borrego.” Front center- Caroline W. & young friend, additional dancers from left- Jeff L., Mademoiselle Irene Ujda, Director of Anza Colonial Dancers, unknown, Roger K., Cynthia Harper & Gerard J. Reyes. Baile de California dancing “La Rueda” a step from “La Contradanza.” Dancers from left to right- Cheryl Long, Jeffrey Long, Caroline Wedderburn, Roger Knox. Join us! It’s not too late to dance with us at Fiesta. See our “Class & Performance Schedule” page or text us, 805.284.1274, to confirm classes. We also invite you to be a behind-the-scenes person with costuming, make-up, hair, stage managing and more.